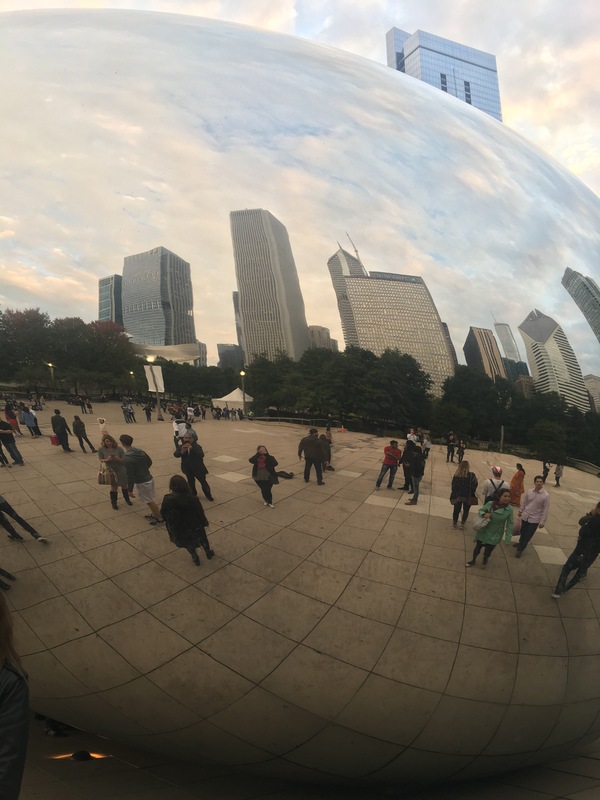 This past weekend, I went for the first time to Chicago, for a little long weekend action. A fabulous city, a must visit! Here was my itinerary. 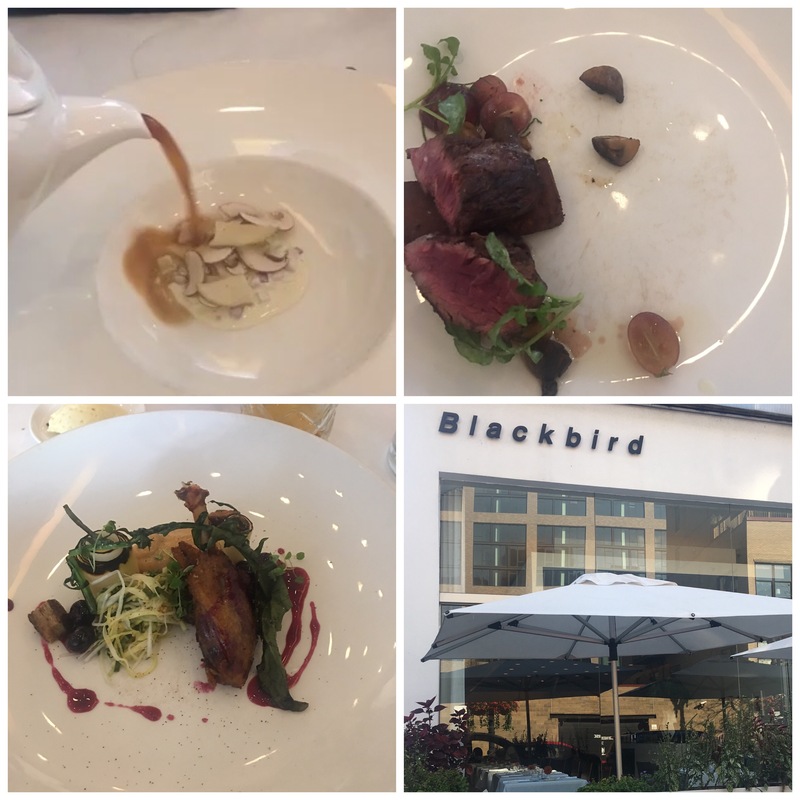 1:30PM: Lunch at Blackbird. I think this restaurant was the one with the biggest expectation vs reality chasm. 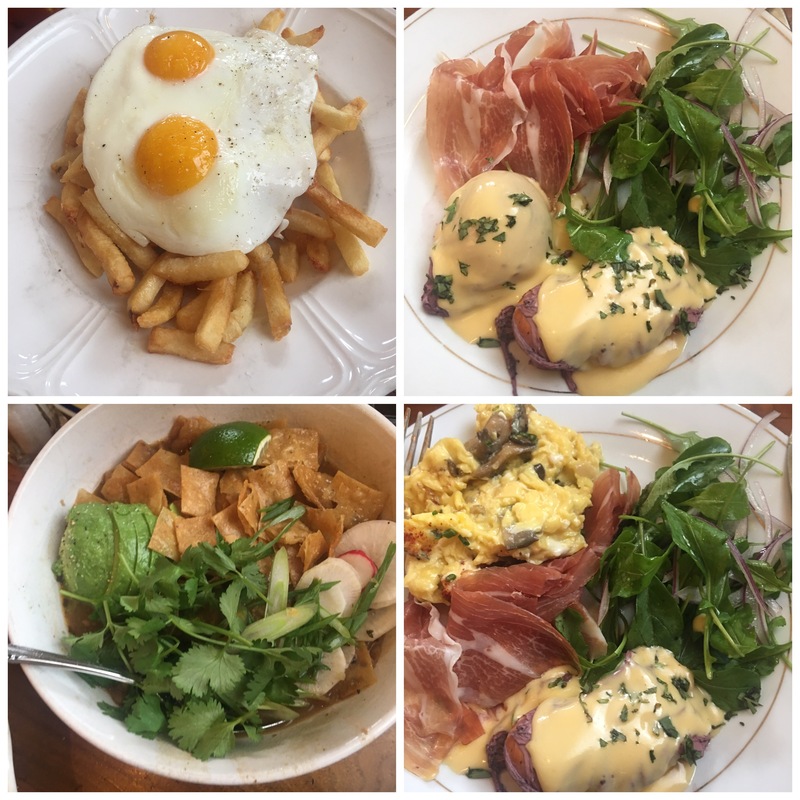 We expected to have a nice simple lunch and we were blown away. First of all their lunch deal is insane. During weekdays you get a 3 course meal for $25. That is a ridiculous steal for how good the food is here. I had a burnt onion soup that was delicious and a hanger steak with concord grapes that was a bizarre yet super satisfying combination. (picture below my dad’s duck which was great too!) A lunch must! 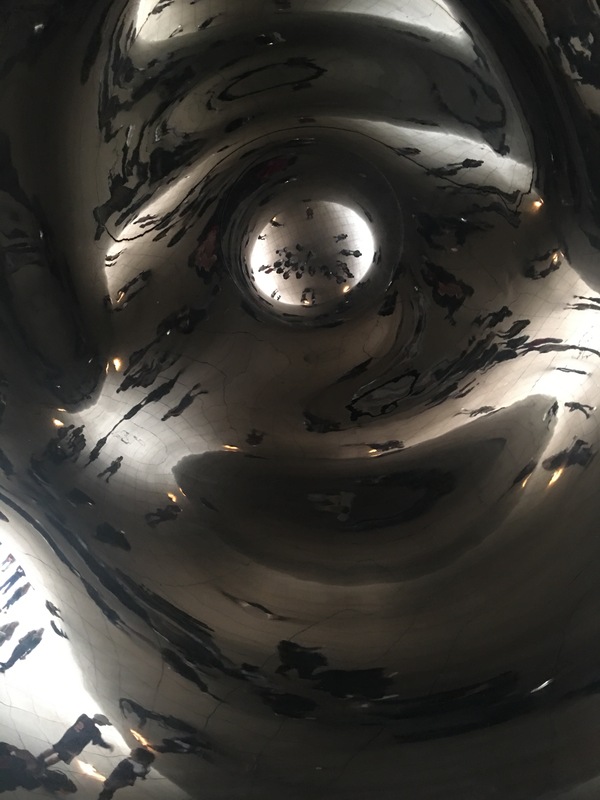 5:45PM Millennium park : Beautiful park, beautiful sculptures.The highlight of course, Anish Kapoor’s Cloud Gate. 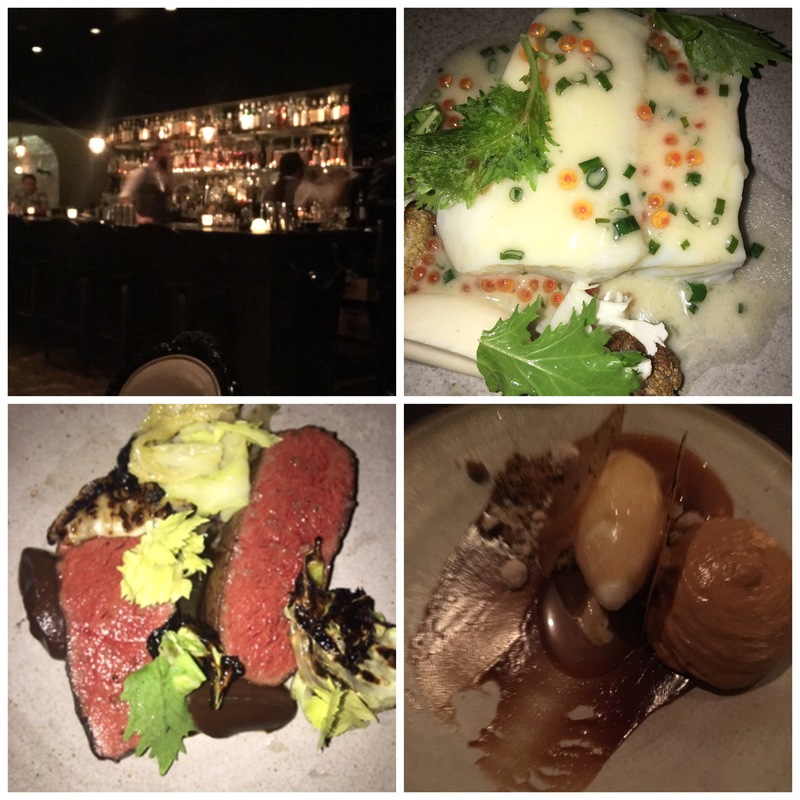 8:00PM Dinner at Boka: The restaurant is gorgeous, very dark but beautifully decorated and with a bar that has a lovely vintage feeling. I had an olive oil poached halibut to start that was light and delicious and as a main, a perfectly cooked venison. for dessert: Hazelnut & Coffee: whole milk ice cream, praline, toasted milk caramel and apple. 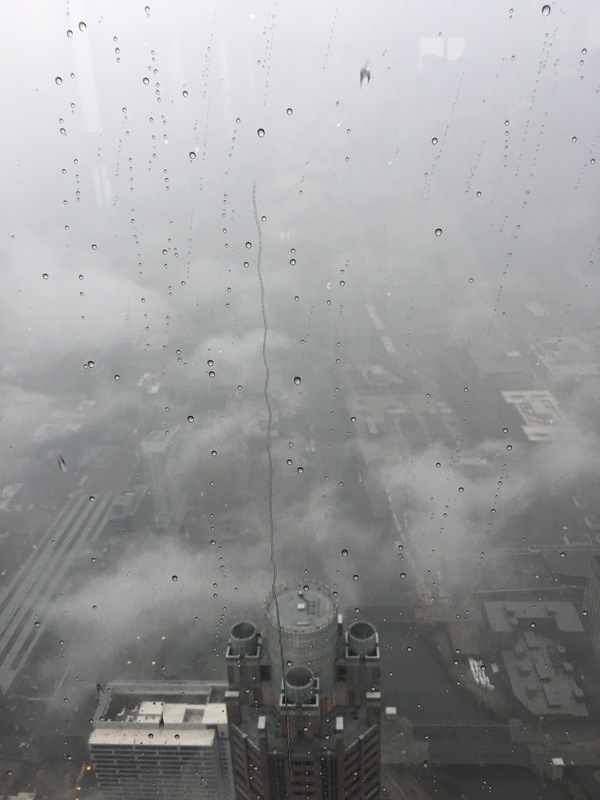 9:00AM: Willis Tower Skydeck: Super important Travel Note: The discovery of the trip was the Early bird admission option of the skydeck. 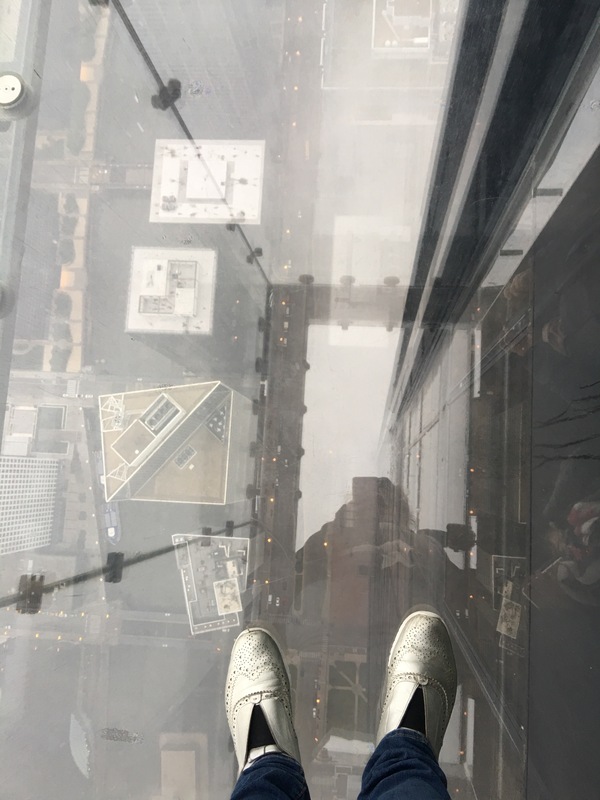 The extra money is totally worth it as you arrive before the crowds and you have the full of the skydeck for a very small group (There were 10 of us). Aside comment: It’s still the Sears tower to me, this whole Willis Tower sounds stupid. We had a terribly cloudy and awful day, but since we have the early bird we managed to get some visibility before the visibility turned 0%. In any case at least we managed to get up there, see something and get some pictures in! 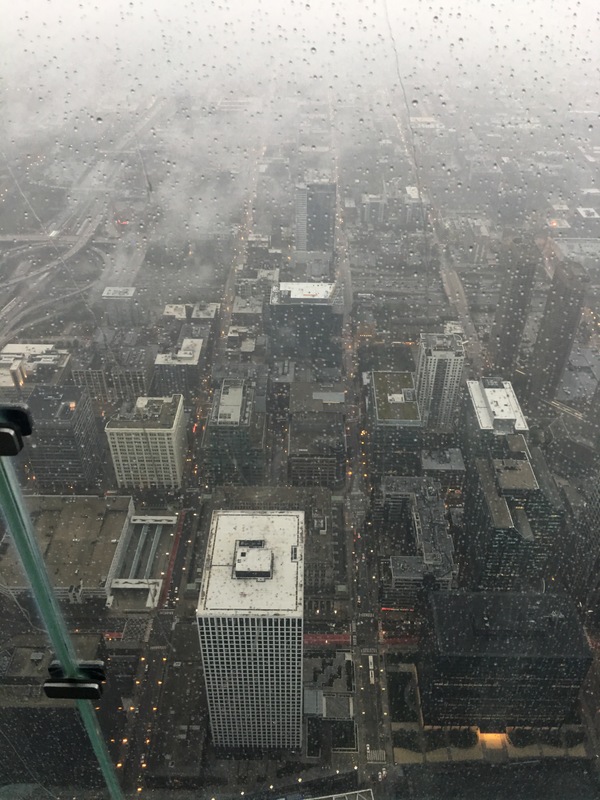 10:30am: Given the torrential rain, a mall is always a good option and we started with the 900 North Michigan Shops. 12:00pm Brunch at Frontera Grill: Unlike Blackbird, which exceeded expectations, I think Frontera was below expectations. 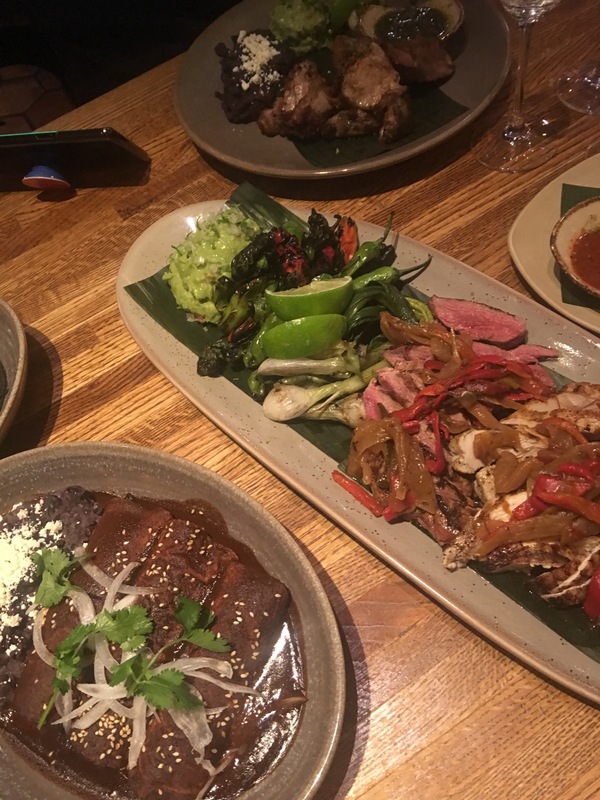 I was curious to try Rick Bayless’ take on Mexican food, and although absolutely tasty, especially the grill items, it was just normal. It probably has to do with the fact that I love mexican food, so im constantly trying new things and this was nothing to write home about. 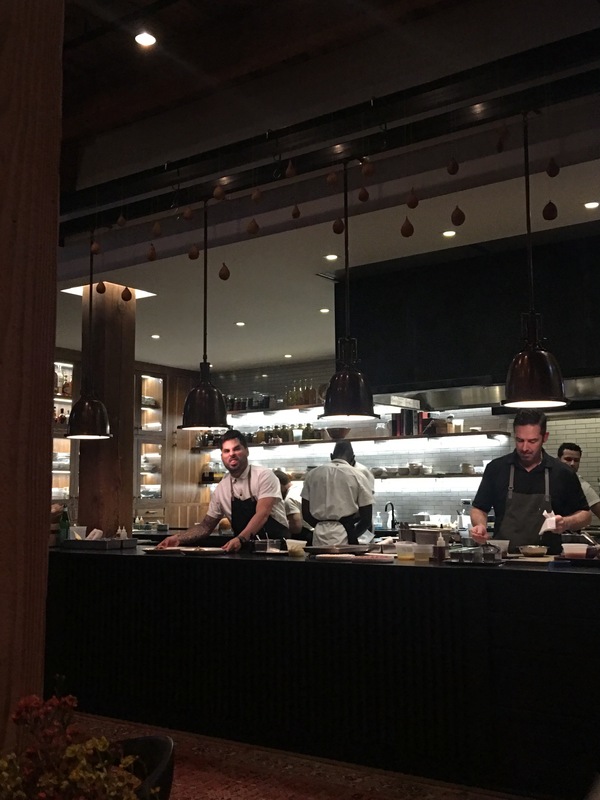 maybe if we were in Topolobambo and not Frontera we would have been more excited, but there are definitely better examples of Mexican being done in the USA like Hugo’s in Houston or Cosme and Empellon in New York. Egg Yolk Soaked In Salted Licorice With Frozen Yogurt Meringue – so weird and inventive. butternut squash in savory and dessert – its my favorite vegetable! how heavy it was. 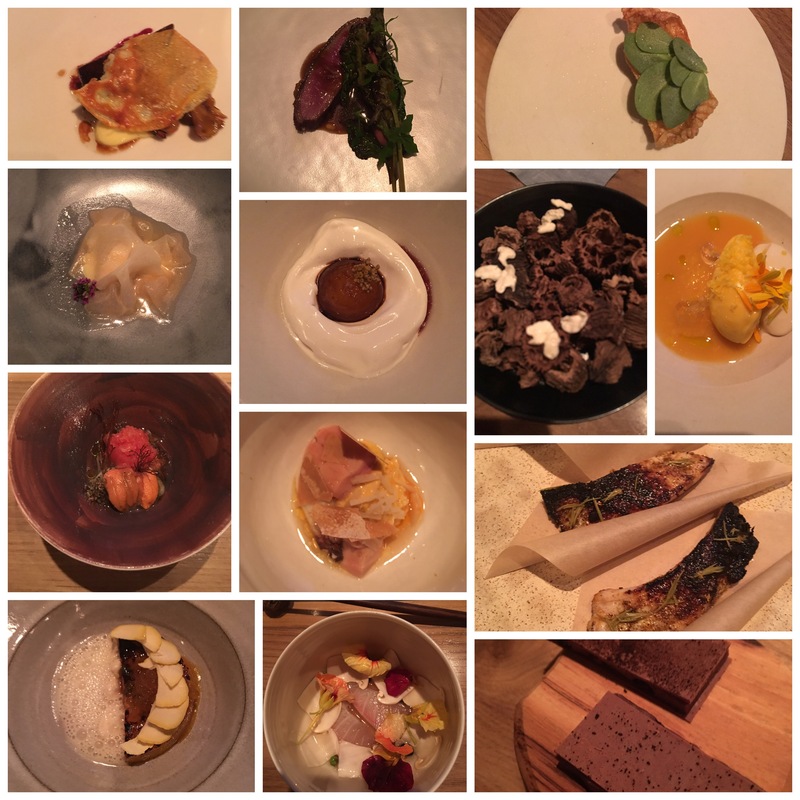 Too much uni for me (two dishes), with the added of a foie gras dish and a bone marrow dish on a 12 course progression was jsut too heavy and not in the type of way I like. 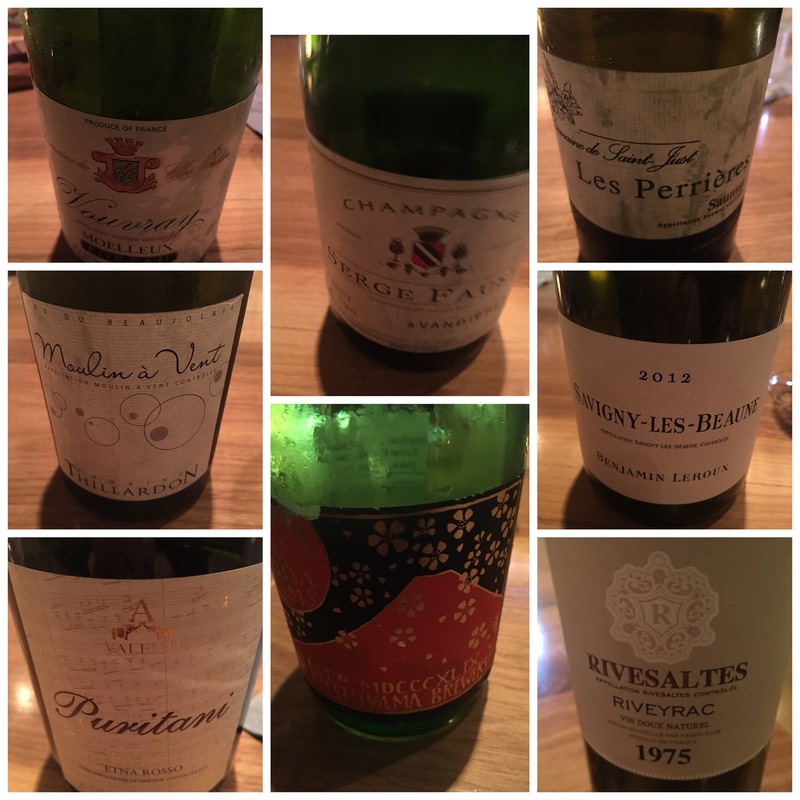 The drinks were super inventful, although I have to say my limited alcohol intake could not take the 5 drink and food pairing they serve, but all the power to those who can. 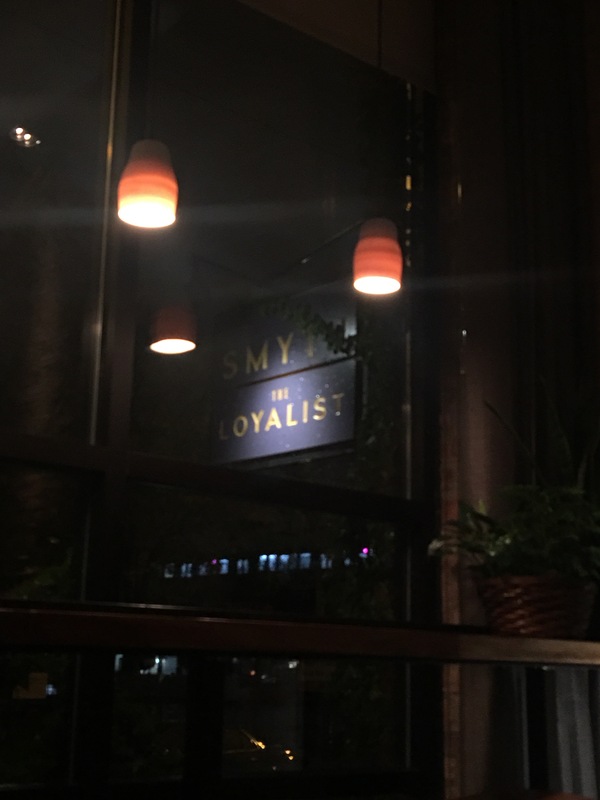 We just stayed for one drink and it was delicious and the place super cool. I had a drink called: Carrot Cake Ramos Rum Fizz which was literally a carrot cake in a glass and I loved it! My sister had the Feather Knows Best, which was presented with a great smoke at the table. 10:30AM: Art institute of Chicago. Travel note: get the Fastpass entrances, they are quite worth it, saving time by not having to do a line, especially in the cold. This museum was also one more thing that exceeded expectations in this city. I knew it was a very strong collection, but even I was impressed. A must visit in Chicago. I loved the architectural juxtaposition of the old building with the new modern wing designed by Renzo Piano. 1:00pm Lunch at The Publican Great brunch food, really interesting decoration, wonderful 80s playlist and super fast service. 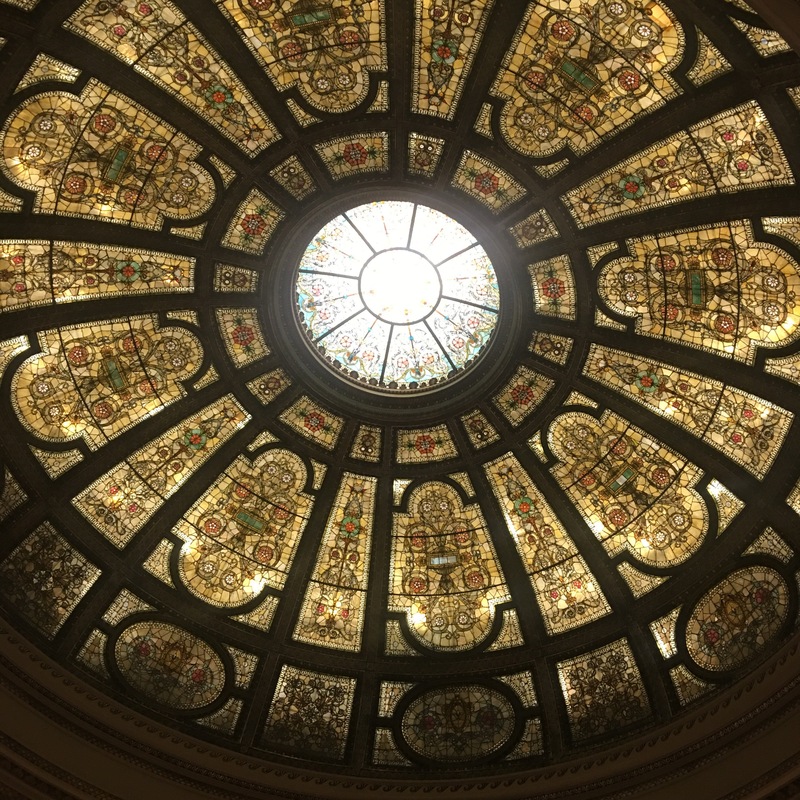 2:30pm: We didn’t feel like hitting any more museums, but we definitely wanted to see the buildings at least, so we took a Car drive around Field museum, Soldier field, the Adler Planetarium and the Shedd Aquarium which are all super close by. It is a great afternoon plan, we were just not in the mood to go in. 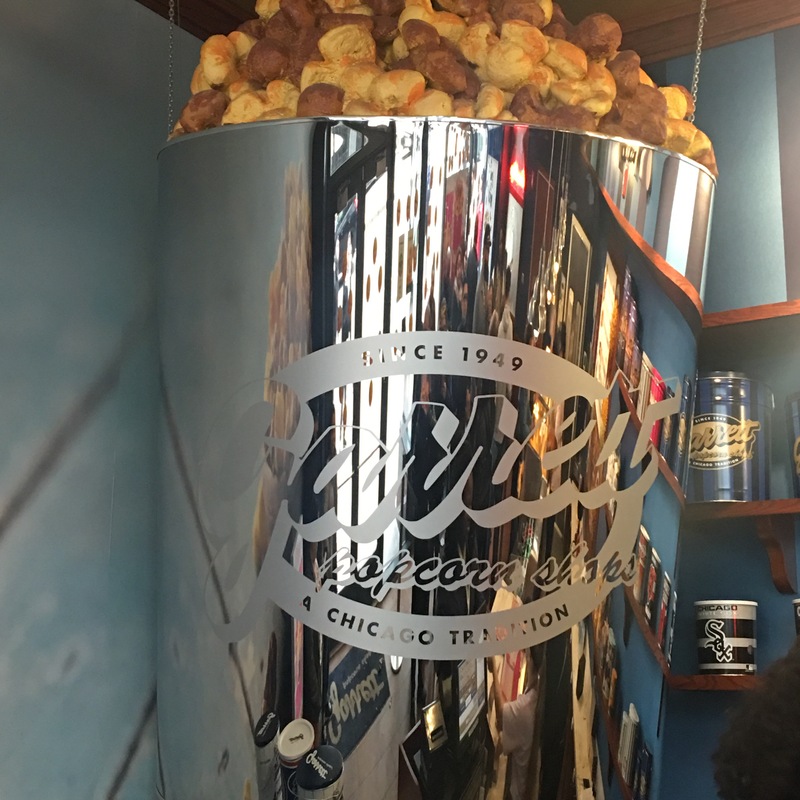 3:30pm: Instead we did a little walk around Michigan avenue with stops at: Garret popcorn to have some of the famous Garret mix (cheddar and caramel popcorn – so delicious) …. 5:30Pm: Massages at the Peninsula Spa perfect unwind from the weekend.